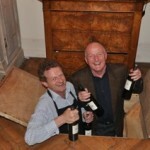 It’s five years since Oz Clarke and James May came to Bauduc at the start of their Big Wine Adventure – the video of the day is on the home page of our main Bauduc website and on the blog here. Oz has been back a few times since, the most recent visit being in March. Here are his thoughts following his visit, with his kind permission. A slightly shorter version appeared in our Gazette, the newsletter we printed and posted to UK customers in May. You can view La Gazette online here. ‘Right, I thought – time to hit the 2010s. So I stopped off at my old mate Gavin’s place, Château Bauduc, and tasted at least 10 barrels of rather fine Merlot before we hit the real business of the evening which was to actually drink as much Bauduc as he could possibly afford without bankrupting him. Which we did – we bankrupted him. We drank the lot. ‘Fascinating: 10 different barrels, each sponsored by a Bauduc regular, judging by the names chalked on each one. Virginia looking a bit sort of bony, Wendy looking plump and delicious and we rather liked Stephen. I feel that Stephen, Wendy and Virginia need a bit of blending and I’m going to suggest that the three of them should get together at a Country Hotel in Norfolk sometime soon for a weekend. The fleshy, the bony and the vigorous. Gavin swears that he’s got their names and addresses and personal details and that it will indeed happen. ‘Although two or three of them were very plump, there was that element of adult tannin about the wines which I was very grateful for. At least half those barrels or two-thirds of them had a soft glyceriny flesh about them, but you had to accept that they had a decent level of tannin, which was delightful because we’ve had far too many wines coming out of Bordeaux and the rest of the world which have been made to try and please adolescents. This wine it seemed to me was trying to please adults. ‘If they’re going to be sold en primeur, it’s an excellent idea to buy them. Last night we had 2006, 2008 and 2010 and I thought it was absolutely delightful that they were all quite different and that’s exactly why people buy Bordeaux – they don’t want everything to be the same. Let them buy Gallo or let them buy Lindemans or something if they want the stuff to be the same every year. If they want the pleasure of getting a wine which tastes of its place, and tastes of the people that made it, and tastes of the year in which it was made then Bordeaux is still the best place to go. 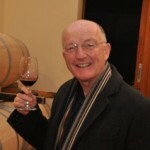 ‘It’s not necessarily the best thing to go and buy the really expensive wines, because the enormous human effort and the enormous amount of investment in machinery and techniques and things which happen there, often, actually, it smooths so many of the edges away that you can’t really tell what you’re tasting or where it comes from. ‘The nice thing about something like Bauduc is you can tell where it comes from and you can tell the vintage and you can tell the people who made it. I thought last night the 2006 developed and changed as the evening went on and was at its best by the time we were coming to the lower part of the decanter – which is exactly what wine should be. There was an enormous difference between the three years. 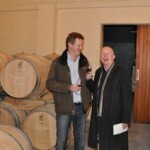 ‘We don’t know where the 2010 is going to lead, I mean this morning if we tasted those three barrels again, for all we know, Virginia might have put on a bit of flesh around the hips and Wendy might have been to the gym for a week and all that would have happened overnight. 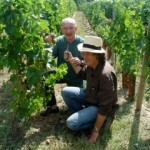 ‘That’s always been the thing about Bauduc, why we’ve always liked it ever since we discovered Bauduc early on – in 2000 ? – when Gavin turned up at my door probably and said ‘taste this or I’ll kill you’, and I said, ‘taste this and I’ll die’, which is not quite the same thing of course. ‘We all complain about global warming making the big Bordeaux too big and the Classed Growths in the Médoc and the St-Emilion Premiers Crus just a bit too much of a good thing. 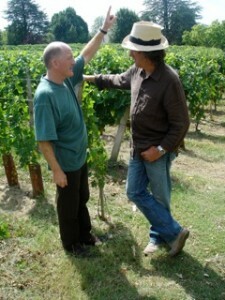 But the global warming is allowing the wines from the lesser known areas to actually fulfill their destiny, to fulfill their potential, and you can get the wines fully ripe – all over areas like Créon, where we are, and the Médoc increasingly is an area where even 10 years ago I used to think ‘oh they taste too earthy, too muddy’. 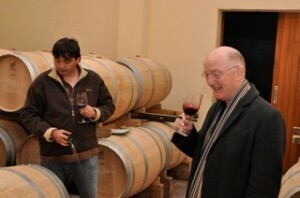 ‘But nowadays you taste them and think this is what I rather like about Bordeaux, and sort of looking into my Margauxs and Pauillacs and finding them a bit too rich and too powerful – and these areas with less well known terroir are making better and better wines, and I think this is very much the case with something like Bauduc. I suspect if we tasted Bauduc 20 years ago, however good they tried to make it, it simply wouldn’t be as complete and round and attractive a wine as it is now. Those barrels we were tasting last night were 14% alcohol that would have been unheard of in the old days. It can’t just be that Daniel and Gavin get out into the vineyards and do a sort pruning regime of some kind of innovative brilliance. ‘Or they can leave the grapes longer on the vines. September and October seem to be relentlessly getting warmer. I remember talking to someone in Pauillac about this and he said that since about 2000 there’s been a significant change and it’s been in that September-October period. It’s also the dryness, which will naturally do a sort of culling and concentration of the flavours. I’m not a massive green harvest sort of guy, I think people try to make the yields too small and that for everyone’s sake, including the chap who is making the wine and wants to have enough to sell, slightly bigger yields don’t actually do any harm. In fact often, you’ve got to know your property and Gavin will know exactly what the best kind of yield will be and it could be anywhere between 30 and 70 hl/hectare. Some years it might be that you only need to make 30 and some years it might be that if you let the vines make 70 the wine might be better. ‘I thought the whites were on star form as usual. The Bauduc white… well, it’s not often that I turn up after a hard day’s rugby watching and airline food and a chap says do you want a beer, and I say I’d rather have a glass of your white wine, please. 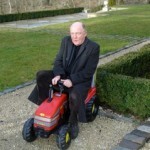 ‘My biggest joy with the Bauduc white is to get the stuff down my throat as young as possible. Stelvin (screwcaps) will indeed help that rather than harm it. But because most people are going to be drinking your white in a pretty youthful state it won’t make a massive difference but I think the 2010 whites are the kind of wines that at the end of every day’s hard work in London, or Ipswich, or Uttoxeter – it’s exactly the kind of glass of wine you want in the fridge when you get home. 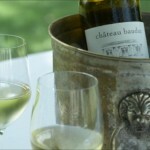 The Sauvignon – the Bordeaux Blanc – is that kind of wine. 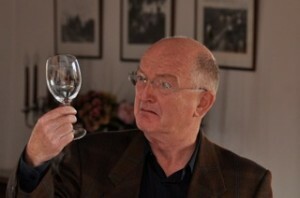 ‘The straight Semillon was excellent – Les Trois Hectares. 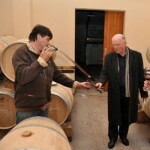 I thought the bâtonnage idea – stirring the lees – instead of oak was very smart: there is a move against oak in white wine at all levels of the market though I suppose you have to except Puligny Montrachet and Meursault from this kind of discussion. But there’s a very significant move away from oak – it might even be a majority of people who are moving against oak now and a lot of the people who like oak are in still in the rather lower end of the market, drinking New World brands and things. But you’ve got to give them more flavour, you can’t just take the oak off, because as with so often with members of the drinking public they say one thing and secretly think another. Like a lot of people will say they want lower alcohol wines, so you give them a blind tasting of six with different alcohol levels and they always prefer the one with the highest alcohol, because alcohol is ripeness, alcohol is lushness in the mouth. ‘That’s reds rather than whites but that Sauvignon/Semillon Entre-Deux-Mers is just 12% alcohol there for a warm year like 2010? So fresh, so tangy. ‘But I do think that those whites that you make, they ought to fly off the shelf because they are absolutely the right wine for 2011: the zeitgeist of white wine drinking – the Bauduc whites hit it bang in the middle. As a bond holder, making me thirsty for the 2011 delivery having just returned from London! !